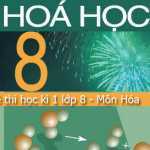 Đề cương ôn tập, thi học kì 1 lớp 6 môn Tiếng Anh năm học 2015 – 2016 mới nhất gồm 8 unit trong chương trình học kì I.
I’m fine, thank you. And how are you? We’re fine. Thank you. How are you? What’s your name? – My name’s Minh. Where do you live? – I live on Le Loi Street. How do you spell your name? – L-A-N.
What’s this? – It’s a clock. What’s that? – It’s a fax machine. What are these? – They’re chairs. What are those? – They’re stools. Who’s this? – It’s my mother. Who’s that? – It’s my teacher. How many students are there? – There are thirty-five. 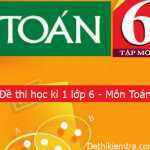 How many danh từ số nhiều are there cụm từ chỉ nơi chốn? are there on the table? How many people are there in your family? – There are four. How old is your mother? – She’s thirty. What doesshe do? – She’s a teacher. Where arethey? – They’re at home. Where + is + place? It’s + in / on + location. It’s inHo Chi Minh City. Is your school big? – Yes, it is. Is it small? – No, it isn’t. It’s big. Which grade are you in? – I’m in grade 6. Which class are you in? – I’m in class 6C. Where is your classroom? / Which floor is your classroom on? – It’s on the second floor. How many classrooms does your school have? – It has 20 classrooms. It’s + số giờ + o’clock. It’s + số giờ + số phút. It’s + số phút + past + số giờ. It’s + số phút + to+ số giờ. Khi số phút là 15, ta có thể dùng a quarter. Khi số phút là 30, ta có thể dùng half. What time is it? / What’s the time? – It’s seven o’clock. / It’s six thirty. What time doyouget up? – I get up at six o’clock. What do you do every morning? – I go to school. What does your father do every day? – He goes to his office. What time + do / does + S + verb? S + verb + at + time. What do you do after school? – I go home and have lunch. What does he do every day? – He goes to school. Do you play soccer? – Yes, I do. Do you play badminton? – No, I don’t. I play soccer. Does she play volleyball? – Yes, she does. Does she play soccer? – No, she doesn’t. She plays badminton. What time does he get up? – He gets up at six. What time does she have lunch? – She has lunch at twelve. What do you have today? – We have English and Math. When does she have English? – She has English on Tuesday. What time do you have English today? – We have English at 7.30. Does she have English today? – No, she doesn’t. My house is on Nguyen Trai Street. It is next to a supermarket. There are many stores on the street. There is a toystore in front of the movie theater. The police station is behind the bank. The post office is opposite the drugstore. The photocopy store is to the right of the theater. The bank is to the right of the bakery. Where do you live? – We live in a house in the country. My house has a yard. There are trees and flowers in the yard. What is there near your house? – There is a park near my house. Is there a lake in front of your house? – Yes, there is. Is there a park behind your house? – no, there isn’t. Are there any trees in the yard? – Yes, there are some trees. Are there any flowers in the yard? – No, there aren’t. Do you live in town? – Yes, I do. Does he live in town? – No, he doesn’t. Ex: How do you go to school? – I go to school by bike. How does she travel to work? – She travels by motorbike. What are you doing? – I’m studying English. What is he doing? – He’s practicing English. What are they doing? – They’re playing soccer. Is she learning English? – Yes, she is. Are they playing? – No, they aren’t. Where are you going? – I’m going to the school library. Who are you waiting for? – We are waiting our classmates. You must go straight ahead. You must not cross the red light.